Our visitor commented that this dish seemed remarkably Chinese... referring to it as "scrambled eggs with prawns (蝦仁炒蛋)". Come to think of it, both the look and the textures are pretty similar... especially when you consider the sprinkle of diced spring onion on top! Stout beer battered Taiwanese bambou and dragon beard, grilled scallop, shitake mushroom paste - this was one the weaker dishes from the last visit, and on this second visit it fared slightly better. I do love the flavors from the stout batter, and was surprised to find a little bit of ground pepper here, but the Taiwanese bamboo shoots were slightly on the bitter side. The scallop was perfect, although it needed the shiitake mushroom paste for flavoring. Abalone with Japanese eggplant - just like my last visit, Sato-san sent us an extra dish from the kitchen featuring Japanese mizunasu (水ナス) eggplant. The eggplant was a little sweeter than expected. The abalone from Nagasaki (長崎県) was perfect, and the preparation very Japanese. The whole thing was topped with sea grapes (海ぶどう) and a salsa verde made with cucumber and other vegetables, marinated in olive oil. Yum. Flower crab bisque flavoured with aged Shaoxing wine, ravioli stuffed with crab and fresh house made cheese - this was damn good! Three triangular ravioli, each filled with shredded flower crab meat and cheese. These were pretty tasty in and of themselves... but they came in a bowl of beautiful flower crab bisque, which was flavored the classic Cantonese way with aged Huadiao (花雕) wine. Slurp! Once again we were served bread made with nukazuke (糠漬け), and used it to soak up the crab bisque. In the end I couldn't resist the temptation, and lifted the bowl up to my face so I could drink the last few drops. Poached oyster in fresh green juice gel, "wasabi, sudachi, green mango, shiso, green apple" - the Hokkaido oyster was hidden at the bottom of the pile, and delivered very strong, briny flavors of the ocean. These were tempered by the jelly on top, made with green fruit juice and green herbs. Also on top were granita made from green mangoes and green apples. Very nice. 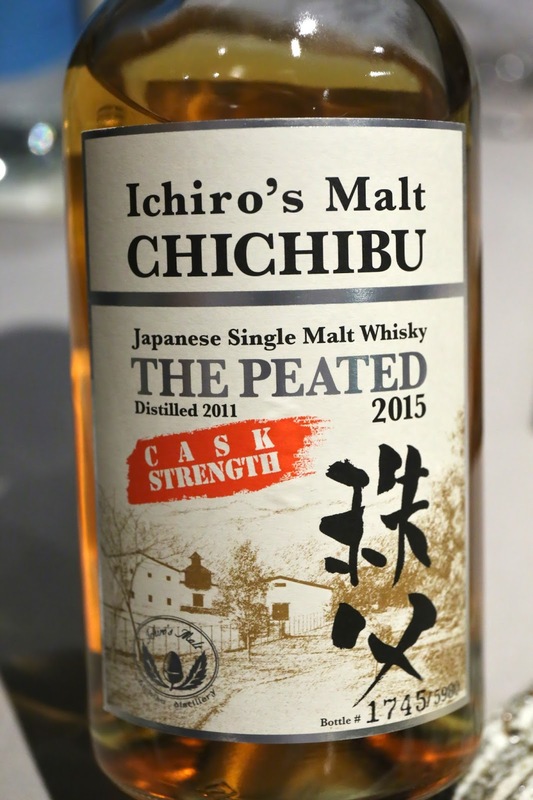 The peat came from this peated Japanese whisky, 2015 Ichiro's Malt Chichibu The Peated Cask Strength. Unfortunately my nose was acting up a little by now, so my sense of smell wasn't as acute as usual... so I didn't quite get the peaty scent. 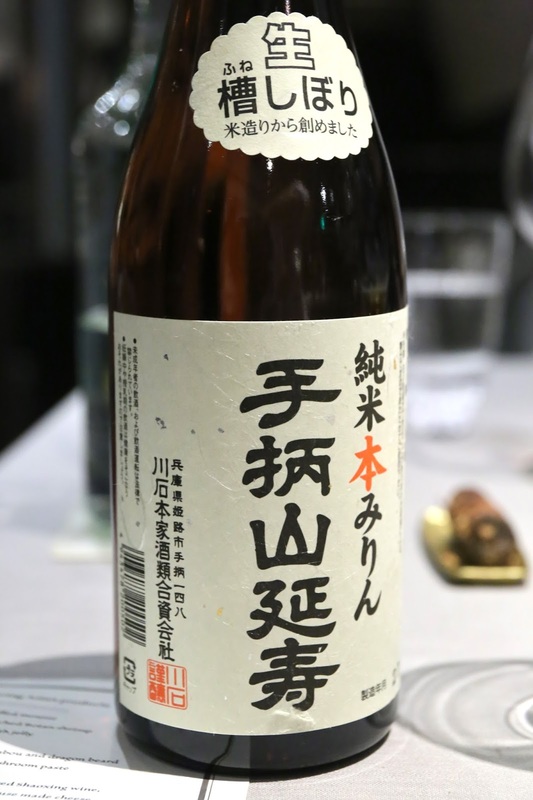 Of course the sauce was also made with mirin (味醂), and I was given a small pour to taste. Now, I don't normally drink mirin... in fact I don't think I've ever really "drunk" it straight, but this was something very different. It was the most viscous mirin I had ever seen, and much sweeter than your average specimen. 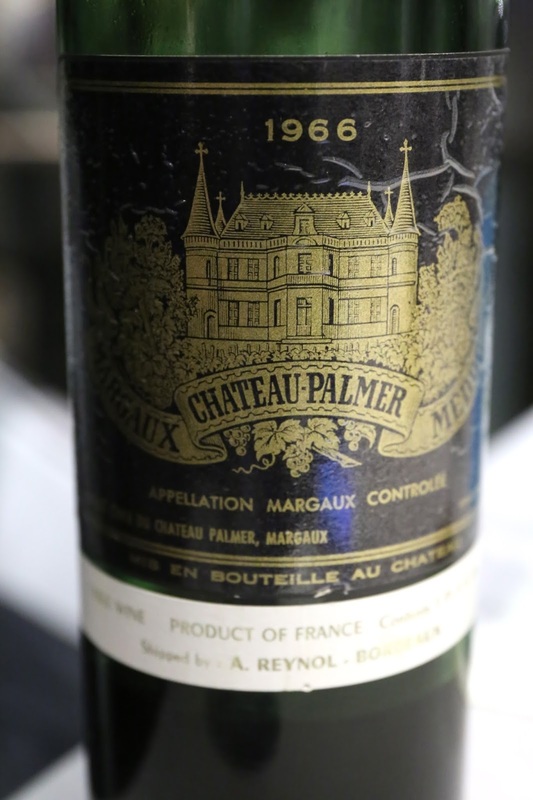 The nose seemed much more fermented, with a lot more depth, and almost a little plastic and smoky. Fresh uni and risoni "alla carbonara" with cauliflower - I was so glad this was still on the menu, because it was among my top 2 dishes from last time. That light, airy, ethereal cauliflower purée was still beautiful. The orzo still provided a small degree of bounce as it yielded to the teeth. And of course the sea urchin was nothing short of wonderful. Definitely a crowd favorite tonight. A little surprised, though, by the presence of ground pepper in the risoni which added a very slight kick. 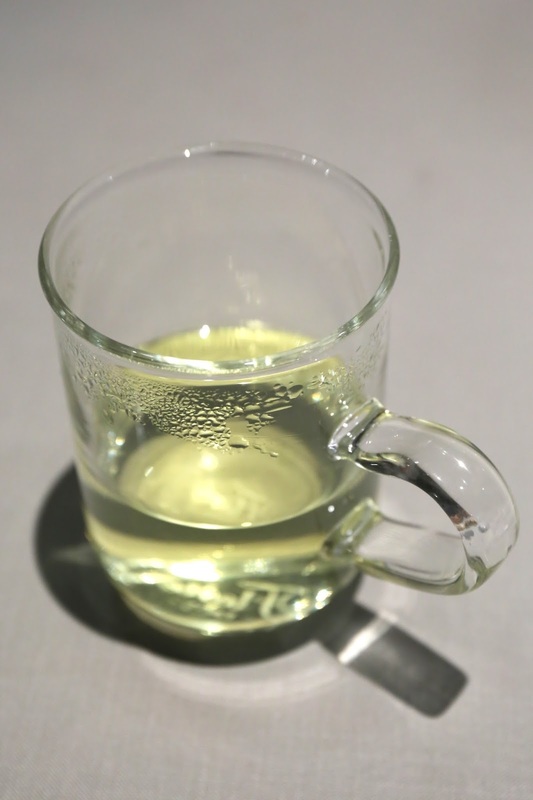 Lemongrass ginger tea - this was a very nice palate cleanser. Wouldn't mind drinking a lot more of this. "Poached ginger ale", peach compote, peach sorbet, new ginger jelly, rice vinegar soda - how do I not love something made with ripe Japanese peaches? The chunks of peach compôte were really sweet and delicious, and the sorbet was pretty good, too. The ginger jelly really added a fair bit of kick here, and the soda did add a good amount of fizziness. Very, very good. Mint and pandan tea - what I missed out having on my last visit... so I had to order it tonight. Unfortunately my nose wasn't 100%, so it didn't smell as amazing to me as it did last month. Added some lychee honey from a local bee farm in Hong Kong. Poached Japanese plum - Sato-san always serves different petits fours to diners who order tea or coffee, and tonight those of us having the herbal tea got these delicious plums. So yummy. Another delicious dinner, and three of us left as happy campers. I hope my other friends enjoyed their dinner, too... since some of them came based on my recommendation!